As the year begins, most of us over 29 (and perhaps, even a few younger) seize the moment to reproach ourselves not just with what we haven’t accomplished in the previous year, but in all the years that came before. The novels we haven’t written (or read! ), the film projects that never got off the ground, the paints drying out in the basement, the guitars sitting dusty and untouched—they all rise up in an angry mob and march on our poor undefended minds. These are the moments that bring on New Year’s Resolutions. Or perhaps you already made yours, and, a week in, have already fallen short of this year’s expectations. The question I am trying to ask myself right now is—why, exactly, are some projects languishing in dusty corners right now? Is it procrastination, a lack of genuine interest on my part, a shortage of energy and/or time, or a failure of nerve? Or just an overabundance of projects? These are really difficult questions, and honestly, I’m still pondering the answers. I’m probably not going to have the answer to all of them before Valentine’s Day, or maybe July 4th. But I am going to try and take a look at each one and figure out what it is actually possible to do in a year, in the full knowledge that, for instance, what I really usually feel like doing on Saturday after a week at my job is absolutely nothing. Which doesn’t mean that if I assign 45 minutes or an hour to doing something creative that engages me, I won’t do it—in fact, I know, if it is a commitment I made in my schedule and my heart, I will. 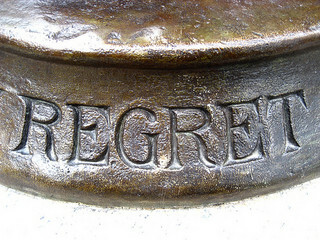 What I’d like, I think, to feel at the end of 2013 is no regrets. That I did what I could reasonably do, and that even if the new novel is, for example, still only 2/3 done, instead of 1/3 as it is now, that it was a good effort, and the most I could do given my own circumstances. And that I was dealing with the scary parts—submitting, getting rejected or accepted—in an effective way, and not putting off what I did not enjoy doing. So this year, instead of a list of everything I’m going to finish by the end of next year, I am going to aim for feeling no regrets about my creative work when I uncork the champagne next December 31st—no regrets, and more fun with my work. I invite you to join me!